A sultry summer's evening and a Mahler symphony, it can only be the priceless Proms. But, while last night's BBC Radio 3 broadcast delivered Mahler's Fifth played by the Bamberg Symphony Orchestra under Jonathan Nott in full-blooded sound, it failed to deliver the unique sonic atmosphere of the Albert Hall. 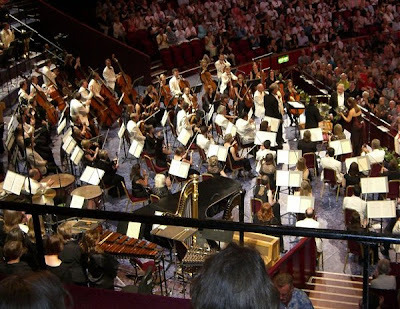 Last year I cited the Radio 3 relay of Elgar's The Apostles from the Proms as a topical example of the curse of close-miking, and yesterday's Mahler symphony provided yet another example with the sonic signature of the venue traded for impact, with the spotlit harp in the Adagietto sounding like a bass guitar and with the heavy hand of the balance engineer squashing Mahler's dynamics in the Rondo-Finale. Whenever I am able to reach the top gallery of the Royal Albert Hall, I always feel it is an ideal place to listen from. The sound is clear and the quality is somehow purified, and the balance far better than anywhere else in the Hall. It isn't at all necessary to sit in front; in fact I prefer the back... you can see nothing, and as there are not many chairs you find people lying on the floor drinking in the sound in a dedicated and impersonal atmosphere. It is the music that matters up there not the performer. So there are, I think, occasions when distance lends enchantment, and space, in two senses of the term, is a help to the ideal projection of fine music. At his Enlightenment Gautama saw himself and all life as a vast process, an ever-moving stream of becomings and extinctions, and within this ever-moving flow and interpenetration of energies he recognised as delusion the idea of the existence of an individual ego. What was taken for the "self" was actually a composite of various aggregates, a series of psychophysical reactions and responses with no fixed center or unchanging ego-entity. It is of great significance that Sir Adrian's book, which was published in the technologically dark age of the 1980s, is sub-titled Words from a Lifetime's Communication. What wisdom can be found in the writings quoted in this post. And what great delusions classical music labours under today. My photo, which I took in the Albert Hall but not from the gods that Sir Adrian writes about (does anyone still call them the gods? ), is (c) On An Overgrown Path 2013. Any other copyrighted material on these pages is included as "fair use", for the purpose of study, review or critical analysis only, and will be removed at the request of copyright owner(s). No freebies were used in this post. Also on Facebook and Twitter. Reading this post, and agreeing with it, got me to wondering about how your other posts about pumping up the bass, e.g. "Should classical music turn up the bass? ", with which I also agree, fit with it. Throwing out this comment in hopes of getting you to write more about the audio/mixing side of classical music, a subset of your posts I find very helpful. I find audio/sound system issues to be as complex and as vital to the effects of music as knowing how to play your instrument - and at least as challenging to master. Lyle, you ask a very perceptive question and it is one that I expected someone to raise at some point. At this point I will answer somewhat evasively that I am still - at the ripe old age of 63! - a seeker in these matters, and quote, again Nancy Wilson Ross - "Buddhist philosophers do not shrink from paradox and contradiction... on the contrary, not only do they seem to accept them easily, as a part of life's inexplicability, they even appear to delight in them". And yes, I will return to the audio/mixing side of classical music music. How right you are to say that the associated issues are "as complex and as vital to the effects of music as knowing how to play your instrument - and at least as challenging to master". Yet, I will wager,that among the hundreds (thousands?) of tweets about that Mahler Prom not one will touch on sound quality. A glaring omission from my thoughts on this Prom is any mention of Helmut Lachenmann’s Tanzsuite mit Deutschlandlied which the Arditti Quartet performed in the first half with Jonathan Nott and the Bamberg Symphony Orchestra. You're too kind - but thank you nevertheless. And what an extraordinary piece it is! Probably the best Lachenmann performance - and doubtless part of that was the communal experience of being in the RAH - I've heard.